It's time for a trip back to childhood. Back in the early 1960s, my grade school library in Flint, Michigan wasn't the most up-to-date. It had one book on model boats. 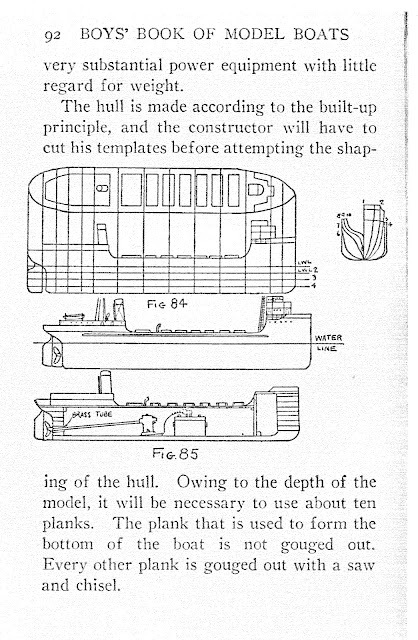 It was Boys' Book of Model Boats by Raymond Francis Yates, published in 1920 by The Century Co. I checked that book out week after week, and read it front-to-back, back-to-front, middle-to-ends and any other way possible. My favorite part was (being a child in a state surrounded by the Great Lakes) the chapter on building an electric lake freighter. I didn't have access to a saw, but I found some 2x4s in the garage that had been cut with stake-like pointed ends. I stacked them, nailed them together, and found other bits of wood from which to make the freighter superstructure and funnel. I even found some small nails and string to model the stanchions and railings surrounding the bow and stern on real freighters I'd seen. Excited to launch my new "scale" model of an actual lake freighter, I insisted we take the two-foot long chunk of lumber with nails sticking out of it with us on our trip to our summer cottage. My mother, however, drew the line at letting me carry a potentially dangerous weapon on my lap during the two-hour car ride. She made me put it behind the seats in the cargo compartment of our Buick station wagon. When we arrived, I immediately changed into my swimming trunks, and insisted we go swimming. I carried my model carefully down the trail through the woods that led to the lake. Casting aside towel and sandals, I dashed into the cold water almost to my waist, and carefully set my lake freighter model in the water. Imagining a band playing a John Philip Sousa march appropriate for the launching of such an impressive vessel, I carefully let go of the model. I never did get that darn thing to float right, but I kept it on a shelf in my room for years. I had not thought of that first attempt at ship modeling for years. 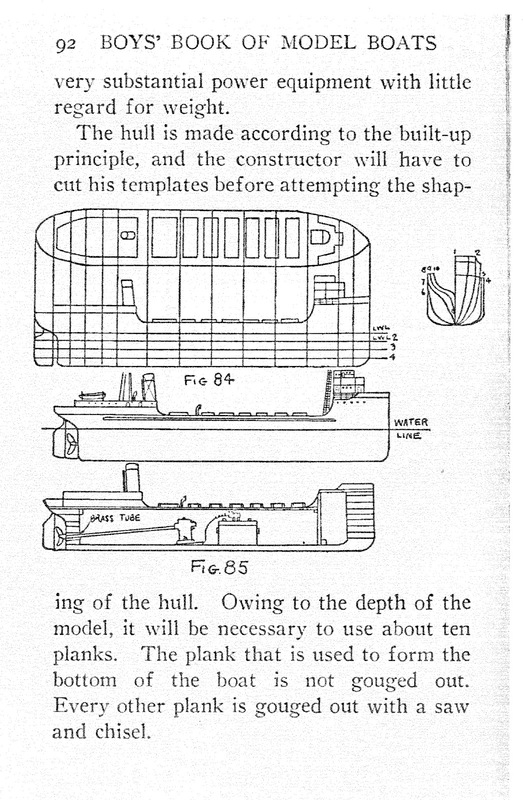 Then, while scouring the internet for ship modeling info, I found a digitized copy of none other than Boys' Book of Model Boats! Reading through it brought all those memories back, so I'm posting a PDF copy of the now out-of-copyright and I'm sure out-of-print book here. I hope it brings back as many of your memories of first attempts at building a ship model as it did mine. Click on the book title link at the top of the post and enjoy!